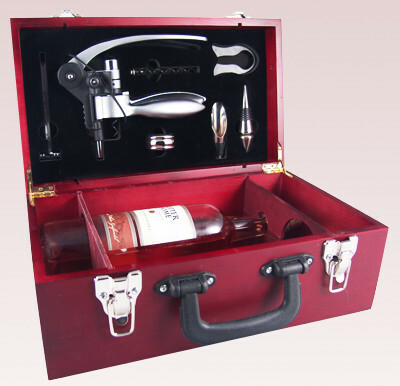 The Deluxe Hazel Set includes a thermometer, extra corkscrew, drip ring, foil cutter (blade), wine pourer, wine stopper, and a large 2 handle opener. In the lower secction there is room for 2 Wine Bottles to be stored. Custom cut wood sections hold the bottles firmly in place. This is one of the most supreme sets we have to offer. Do not miss out on this great Holiday Gift Special. 6"H x 13"W x 8"D [HF581] Credit card orders instructions. 1. Complete your information in the checkout. 2. Select Paypal payment as your payment method and come to the Paypal payment screen. 3. Click on "Don't have a paypal account" option. This will take you to the section to complete your credit card information. Return policy is stated in our About me section.